Pear drops or Fruit Salads! I just have to share this little beauty with you, not one of mine I hate to admit but I wish it was and I am definitely going to have to make it!…. this one has been knitted by my dear friend Vicki. The design is Pear Drop by Ysolda Teague, it’s in the the Saturday Treats booklet, which I have priced at £9.00 or as a single download from the Ysolda website for £3.75. It has been designed for knitting with the Fyberspates Scrumptious Lace but Vicki loved the colours in this particular yarn as it reminded her of Fruit Salads……not the healthy kind I may add but the little penny chews you could buy (and maybe still can) that are very mouth watering and coloured, well, just like this yarn!! The yarn is a Knitting Goddess Sock yarn, 75% Merino 25% Nylon and is named ‘Summer Sun’. I think Vicki’s association with Fruit Salads would have made a good name for it! I do have a good selection of Knitting Goddess yarns in stock, some fabulous shades, the colours mixes are really exclusive. (You can just about make some of them out in the basket that the shawl is draped over) I’ve not got the Knitting Goddess yarn on the website yet, another on the to do list but Knitting Goddess does have her own website. Other alternatives that would work well in this shawlette are Lorna’s Laces Shepherd Sock or Lorna’s Laces Solemate – the ‘Outlast’ component in Solemate is a fibre developed by NASA for use in space suits and has exceptional temperature regulating properties but added to that, it gives an amazing drape and subtle sheen which will work well on any shawl or shawlette. There’s also Malabrigo Sock which is 100% merino, a deliciously soft yarn which blocks beautifully as I found with my Ishbel. 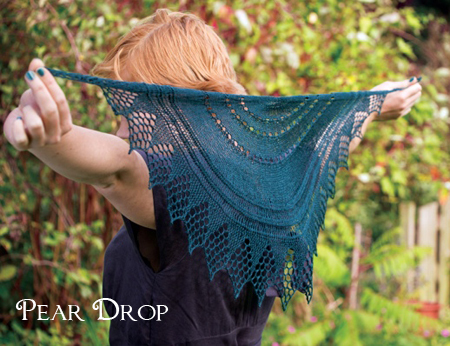 Or of course a lace weight yarn as this is what the pattern is designed for. 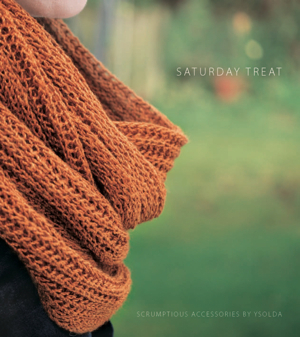 I have enquired about stocking the range of Fyberspates Scrumtious colours by Ysolda so I’ll have ‘the yarns for the patterns’ in Saturday Treats, I’m just waiting to hear from them that they have them all in stock so fingers crossed! The yarns used in the book are the Scrumptious Sock yarn in a deep blue called Dandelion and Burdoch and a pale green called Flying Saucer, in the book the blue is used on a hat and the green is used in a gorgeous pair of fingerless wrist warmers which I have to have and they ‘must’ be in this colour! Also, used is the lace weight in the Pear Drop Shawlette in a deep purple called Wine Gum and there’s a kind of cowl in a terracotta lace weight called ‘Treacle Toffee’. The other 2 yarns used are Aran weight, a gorgeous little scarf in the duck egg blue called Sugar Mouse and a lovely red used in a hat called Empire Biscuit. I think I’ll probably end up making them all!! I’ve also got Malabrigo Lace on order which is due next week, as deliciously soft as it’s neighbour Malabrigo Sock, six shades on order, these will work well on Pear Drop as they will behave very similar to the Malabrigo Sock when it comes to blocking. And finally, there is of course the beautiful Debbie Bliss Rialto Lace, priced at just £5.00 for a 50g ball, 100% deliciously soft merino in some fabulous solid shades……(I can see Pear Drop in the Charcoal). Rialto Lace makes a very reasonably priced alternative, the yardage on all laceweights is over 1000m per 100g, the shawlette in Saturday Treats only needs 25g for the smaller size and 50g for the larger size so one for you and one for a Christmas present or just one large one for a fiver!! I have so many projects on the go that I must make an impression on before I can even allow myself to consider starting Pear Drop or anything else from Saturday Treats for that matter so it’s time for me to crack on now!! I have so much to think about……what will I make Pear Drop from?! Stuffing cushions and wool, wool, wool….. I apologise for not blogging for a while but there has been so much happening here lately that I haven’t seemed to find the time! We had a fabulous weekend 21st/22nd May when we combined Woolsack Stuffing Event with a yarn review for Knit Now Magazine along with the monthly Knit and Natter………so it was indeed, very woolly! I’ve also spent hours upon hours loading up the new website with products and I have to say, I’m quite proud of it! Still lots to do but it now looks a lot healthier! 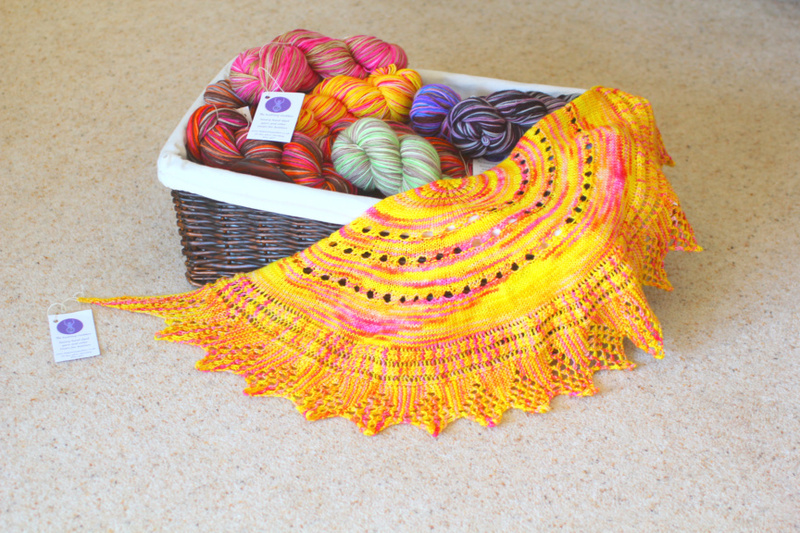 I love the MillaMia page, and the Adriafil KnitCol page….the tiny balls of yarn for colour pick are sooo cute! The Namaste bags have been really popular and all the images are now on for those. Twilleys of Stamford Echo – 100% recycled T-Shirts and Jeans has been a big hit too and is surprisingly nice to knit with…..the rep told me it was like knitting with string, I beg to differ, knitted on KnitPro Nova Metal needles, it’s a dream! I’ve now ordered the bulk of the Autumn Winter yarns, I have two new yarns coming in the full range of shades from Debbie Bliss, I’ve also chosen to stock Rialto 4ply and Rialto Aran both a beautiful tight twist merino and Riva which is a colour change yarn with a loose twist in a chunky weight. The pattern previews are devine, I don’t want to wish away the summer but I am looking forward to winter woollies again!! The Bergere rep is coming tomorrow, and as usual, Bergere have some fantastic designs and premium fashion yarns at not so premium prices! I have no idea how much I will end up spending as it’s so difficult to hold back with so much choice!! Sock Yarns remain ever popular, the kits are not on the website yet but are still available if you contact me directly. A kit consists of the sock yarn of your choice, KnitPro stitch markers, dpn’s and a sock pattern. Kits start at £10 and are upgradeable with more expensive sock yarns and KnitPro dpn’s. Our own yarn, not all on the website yet, is selling very well! There are limited quantities in the dyed yarns, generally just enough to do one large garment (ladies coat, man’s aran) with a few balls to spare for a matching hat and gloves. I’m knitting an aran from the Bergere Irish Mag at the moment in our own 100% Suffolk X and I’m loving it! Lorna’s Laces are here now too, again, not yet on the website but they should be on this week. I’ve got quite a few Mafana Bags on the website now but also a lot that aren’t on so if you’ve seen one you like on the Mafana site and can’t see it on my site, it’s always worth dropping me a line! I hope you like the new website, it is worth logging yourself in to an account to benefit from the ‘wish list’ feature!! Also, with an account, you can subscribe to offers and newsletters so I can send you discount codes etc! Also, please do feel free to add comments to pages about products you have tried, it really does help others to see a real knitters opinion on the product! !